Most cars didn’t have radios when the business started in 1964 and CRS met the need for them as a retail aftermarket supplier and installer, opening a number of additional shops before acquisition by Smiths Industries in 1974. Smiths renamed it Autosound, added more outlets and equipment marques and branched out into the sunroof, electric window and car alarm sectors, diversifying into the caravan, tractor, truck and coach markets as more and more cars started to be fitted with radios from new. In 1980, the main BT Celnet dealership was taken on. A key development came following the 1980 Transport Act which enabled coach operators to run whatever tours they liked. Suddenly there was a demand for in coach entertainment systems. Autosound developed appropriate equipment and in 1982 opened a separate coach division. When Smiths Industries decided to divest Autosound in 1985 it was bought by the management team of Alan Burnell and Neil Millington who modernised it, but, recognising the changing car market accepted offers for the retail operations in 1995. Alan retired and Keith Ellis became a Director. The BT Celnet side was sold back to BT and Autosound concentrated on supplying and servicing in coach systems from premises in Bradford. It had become the sole supplier of the Blaupunkt (now Bosch) Professional range and in addition to servicing this brand also provided service for Panasonic and Fujitsu. Development of the business had seen Autosound begin supplying manufacturers in addition to supplying direct to operators, and this became an increasingly important element of the operations. Specialist dealers were also appointed to assist on the servicing side. Ten years ago, in 2005, Keith Ellis and Lee Fergus who had been with the company for 21 and 13 years respectively at the time, bought out the entire shareholding from Neil and continued to trade from the same premises under the same name. Neil retired aged 55 and has no more financial link with the company, but as his preserved coach fleet occupies one of the units on the same estate, they still see a lot of him. They didn’t have the most comfortable of starts because within a couple of months of signing on the dotted line, TransBus International, a major customer, went bust. Despite this unsettling knock, they remained on course, supplying Blaupunkt in coach systems and gradually diversifying by introducing their own range of products. Today, the OEM side of the business is particularly strong, with demand from bus manufacturers as well as coach builders. ADL, Optare and Wrightbus are all customers in a market that places big orders for simpler systems, many of which go in to export vehicles. If something special is required, Autosound will source it. An example is a speaker for Wrightbus with a polypropylene cone rather than a paper one as it will be fitted in a duct and there may be moisture. Whereas for bus builders it is largely a matter of supply, for coaches there is a greater degree of involvement required. At Plaxton, they supply on a line fit basis and provide any technical advice required for more technical systems such as drop down motorised screens and satellite television systems. It is a similar story at coach dealerships. For the associated Moseley companies, the company’s engineers install the audio and video systems on VDL Futura 2s at Pontefract. On the minicoach side, customers include Steve Peach at Connaught and Alan White at Minis to Midis who take systems including reversing cameras and entertainment systems. Once upon a time the majority of installation work was done in Bradford, but over the years this has changed and with greater utilisation important to the economics of the business, the demand is for Autosound’s engineers to undertake jobs at the customer’s premises. There are four extensively trained engineers who drive four differently promotionally liveried service vans, three Renault Kangoos and a VW Transporter. They travel the UK to wherever the assistance is needed, whether for installation or repair. A major part of the Autosound proposition has always been the support and repair service. To a large extent, it is the confidence this gives operators that they will never be unable to fix something that goes wrong, that attracts the custom. Staff in the workshops have decades of experience and if a unit can be fixed, they can fix it. All Bosch equipment comes with a two year warranty that is extendable at a cost, while everything else supplied is offered with 12 months warranty. 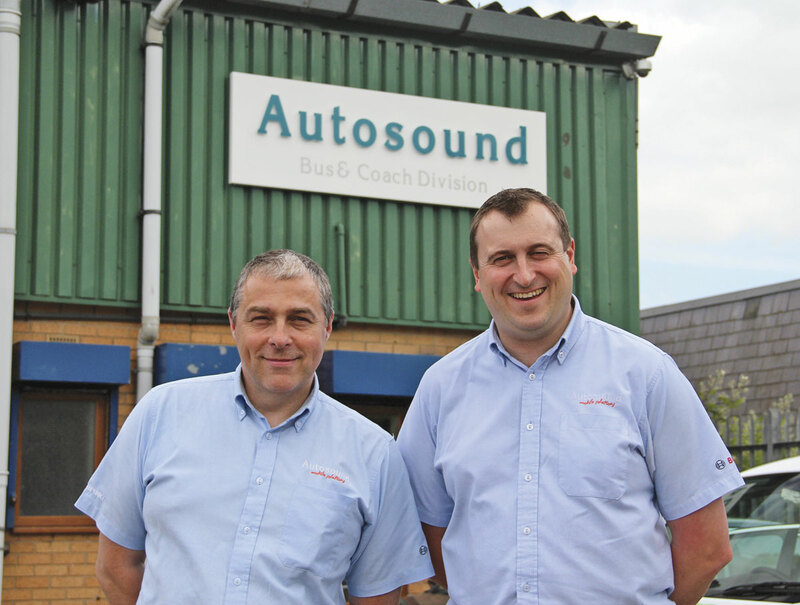 Keith and Lee praised their team, describing them as ‘one of Autosound’s biggest strengths’. Staff turnover is minimal and, as Keith says, ‘if you keep staff you don’t lose the knowledge and have to start again’. In total there are 11 in the team, including the directors – 11.5 if you include Neil Millington who continues to take an interest though he isn’t on the payroll. 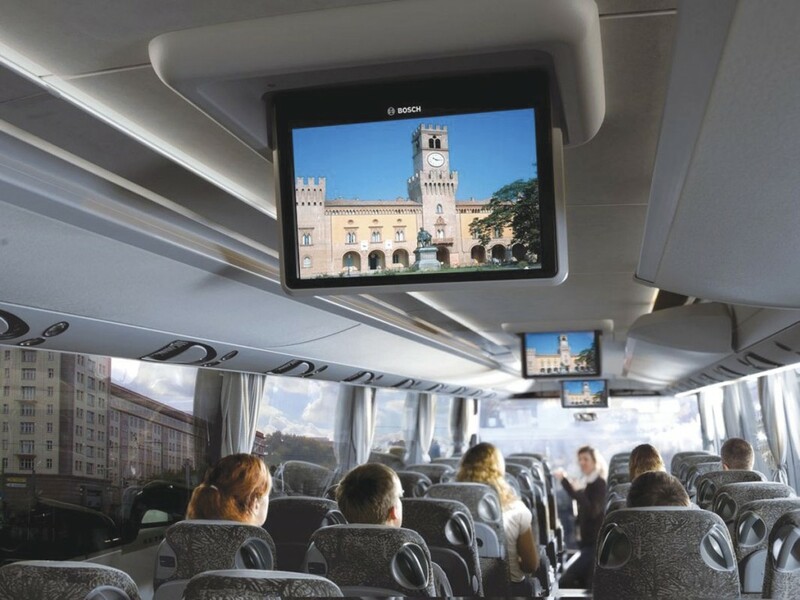 The backbone of the product offering is the Bosch coach multimedia range. Blaupunkt was previously a Bosch owned brand and when the German manufacturer decided to sell the Blaupunkt side to a separate company, it re-branded the coach equipment under the Bosch name. Slightly confusingly, in addition to being the UK and Ireland distributor for all Bosch Professional Line systems, including audio, video, microphones, monitors and navigation systems, Autosound remains a Blaupunkt agent as it services car equipment for the new owners. Top of the Bosch range is the Professional Line 3 family which includes the CCS Professional, the head unit that controls all audio, video and navigation systems and includes an integrated DVD drive. The CCD Bluetooth professional is a display unit with integrated radio and MP3 CD drive that shows the various content and enables it to be controlled. Amplifier options include the CPA811 and the more highly specified CPA2011. An alternative to the Professional Line 3 is the simpler Classic Line 3 which includes a coach radio, a minibus radio, a combined coach radio and DVD unit, the BPA49 two input amplifier with driver microphone priority and the CMA12V amplifier. Other items from the range include the Video Box and Video Box Monitor, speakers, microphones, Multi-Channel Audio Systems (MAS), reversing cameras, various types of coach video including fixed and powered fold flat designs, navigation systems, movie changers and city bus infotainment systems. Expected shortly is a new dual-SIM Bosch wi-fi system suitable for buses and coaches. It will be retrofittable in existing vehicles, ‘we’re really looking forward to it,’ said Lee. A demonstration unit will go on test with a UK operator within the next few weeks. Another brand Autosound has taken on board is Funturo, which provides media on demand at every seat, in the same way that passengers experience on some long haul airline flights. It costs around £1,000 a seat and gives passengers a previously unobtainable level of personal choice. 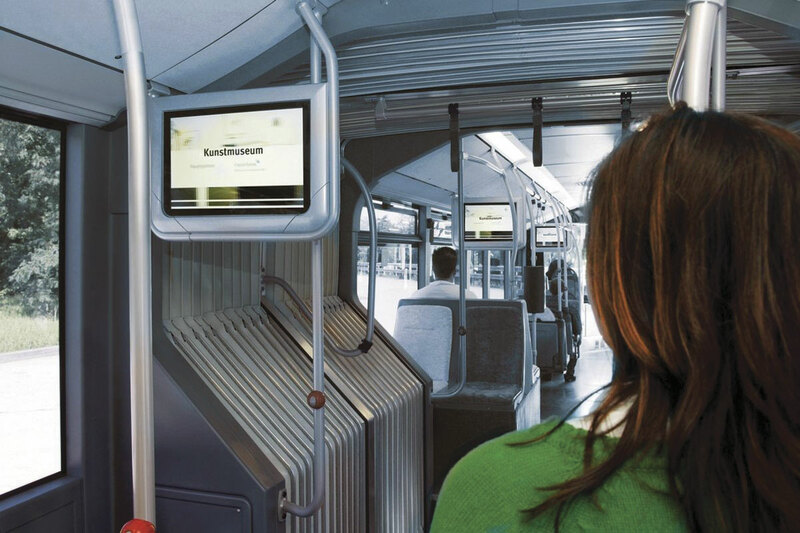 As well as stored content into which the traveller can delve, it will provide internet connectivity, show footage from the front view camera, provide a map view from sat nav, deliver digital television, and you can also run a DVD through it. The next generation will include web browsing. The system has a removable hard drive that holds all content including music, pictures and movies. Early customers for the equipment are Siesta, who have it in three new Astromega double deckers and retrofitted in a Berkhof Axial and Parrys International who have specified it in their latest Neoplan Starliners and Van Hools. Both now manage their own content. Once the hard drive is plugged in, changing play lists is relatively straightforward using drag and drop screens. The move into offering own brand products was a logical one that is an extension of the desire to offer customers what they want when they want it on a one stop shop basis. Bosch are renowned for the quality of their products, a reputation earned because of the effort they put into developing and proving their products. This takes time and often there is demand for a product long before they can bring it to market. By sourcing their own equipment, the team are ensuring that they retain their customers rather than losing them to a competitor. If they see a gap in what is offered by Bosch or something new that may appeal to the market, they source a quality supplier to produce it. In some cases, such as on an older vehicle, the customer does not want to pay for the quality of the Bosch system, and something more basic at a cost that reflects this will also ensure that Autosound can supply. Inspiration for new products to offer isn’t just a matter of listening to what customers say they want, the pair like to be a lot more proactive than that. They visit a lot of electronics fairs to see what is new and what can be adapted to serve their markets. ‘We’ve been to Hong Kong, Taiwan, Korea and China, we’ve been to Berlin and we went to the biggest event of its kind in the world which was held in Las Vegas. You’ve got to keep refreshing yourselves and keep up. You’ve got to do it even if they are long journeys and involve long waits at airports. It was spotting something at a show four years ago that kicked off the classic cars side,’ said Lee. Illustrating both the willingness to help with specialist applications and the extent to which they offer up to the minute solutions is a recent job for Mullaneys. 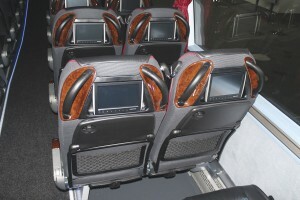 They have taken two ADL Enviro400s for a film themed attraction that have had high grade Professional 3 system installed with sub-woofers under the seats, amplifiers and a media player, as well as two high resolution DVI Bosch screens showing film clips at two predetermined locations triggered by an external GPS aerial. ‘We can do any sort of bespoke system,’ said Keith. A new product from the company’s own range, suitable for bus and coach, is the Virtual360 monitoring system which uses multiple cameras to monitor the area around a bus in its entirety, stitching the separate images together to give the driver a view without blind spots. An eight inch LCD screen installed in the cab provides the all round view in colour, enhancing safety and easing parking. 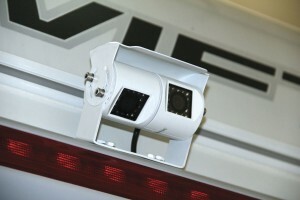 CCTV for coaches is becoming more common having become almost universal on buses. Complete systems are offered, an eight channel set up costing around £2,300 including installation. In this market, the main call is from smaller operators. Again this is an Autosound product. Lee recently attended the ALBUM Conference in Edinburgh where the main product being promoted was the EasyGuide city bus passenger information system. This employs GPS triggering to deliver voice announcements and next stop route information at the appropriate point on a journey. It can also play live television, maps, advertising and other material. Feedback was positive and Lee has a number of follow up calls to make as a result. ‘Originally it was just putting a video and or a television into a coach. It was a big market because nobody already had them fitted,’ he said. Today, it is more likely that an operator will order items and fit them in-house, especially within the big groups. A big change at the moment is that safety systems are becoming as important as those providing entertainment. Autosound are looking at various possibilities including driver fatigue warning systems, lane departure warnings and forward collision avoidance systems, though in the latter case this would not be retrofittable. Most recently, the wheel has come full circle for the company because it has started supplying car products again, albeit very specialised ones for the heritage market. A new venture has been established called classiccarstereo.co.uk which develops, sources, supplies and if required fits the units in cars, many of which are quite exotic. It is based at a second unit within the same industrial park as Autosound’s existing premises, which is also the home of another new development within the company, servicing the motorhome and caravan sector. Together they operate under the Autosound Leisure Solutions brand. 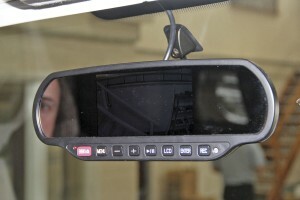 Popular with minibus and CT operators who were getting dash top units stolen because thieves thought they were satnav devices are these mirror monitor units with twin camera input. It has a forward facing camera and two other AV/camera inputs. 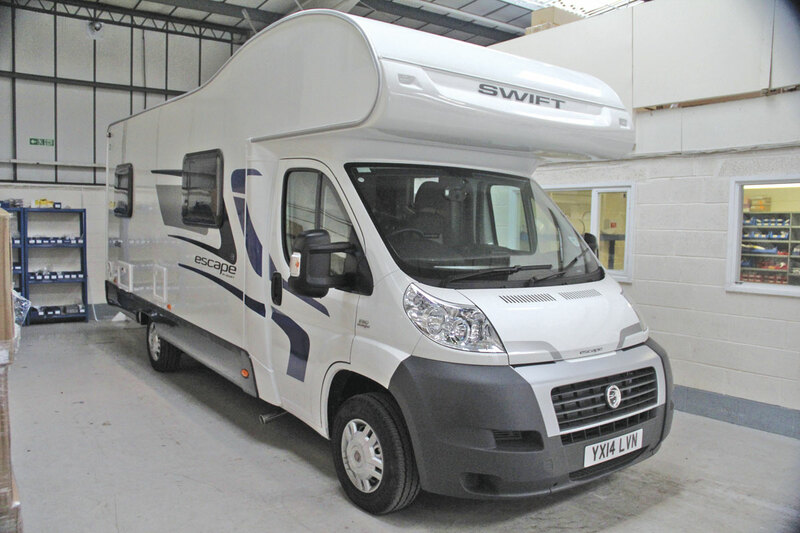 To boost sales within the motorhome sector, a new Fiat Ducato based motorhome has just been purchased as a demonstration vehicle and equipped with a variety of devices that the company offers. Many of these are also of relevance to the coach market. 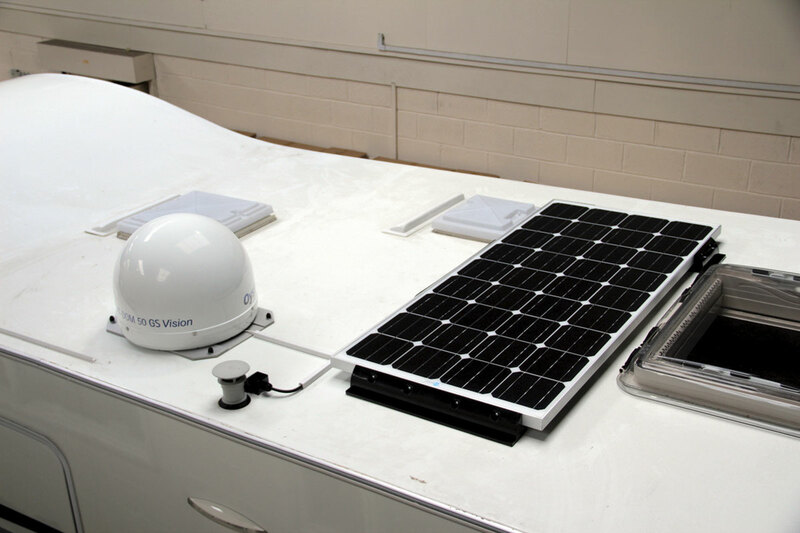 They include solar panels, which can be supplied in a variety of sizes up to 150W, the top unit costing £479 plus fitting. 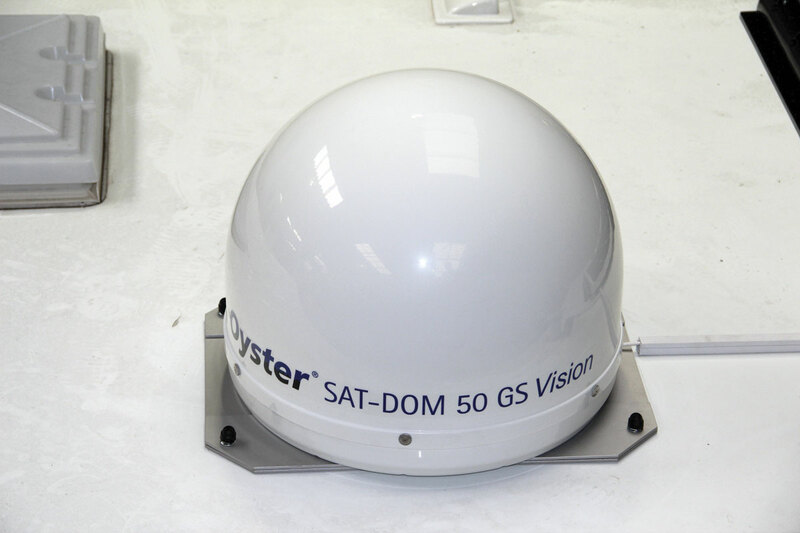 The latest generation Skydome satellite television system is new to the market and costs £2,000 plus fitting. Inside the motor home I was shown another couple of interesting devices, including a flush mounted twin USB charging socket that costs only £10 plus fitting and fits in place of a cigarette lighter. Already popular with Community Transport operators who have experienced break-ins to steal reversing cameras because they thought they were sat nav devices, is a mirror unit with a twin camera input. Costing £350 plus fitting, this smart unit provides a front facing camera and two other inputs so you could have a reverse view and any other AV input such as a sat nav or a television. 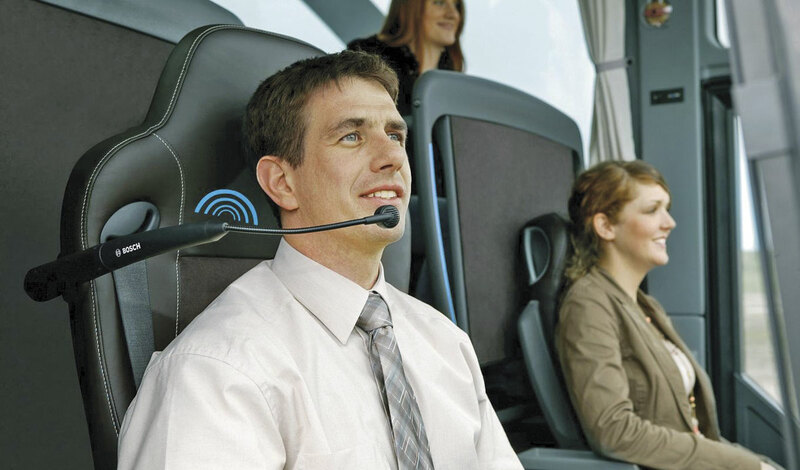 These activities help boost revenue and keep the breadth that Autosound has found in the past can be all important as markets change, but they do not mean that the Directors are taking their eyes of the core bus and coach operation. Although there has been diversification, the bus and coach industry still represents around 75% of Autosound’s business. The association with Bosch and Blaupunkt remains very strong, but through its own branded products and those of others such as Funturo that it represents, Autosound provides its customers with a one stop option for bus and coach entertainment and electrical systems. Under Keith and Lee, the sound foundations laid down by Neil and his predecessors have been built upon as the company has adapted to meet the changing market and maintain the edge that it has always sought, underpinning this with a level of support that gives operators confidence whatever the product is.